It was in 1994 that Ted Caton discovered in a drawer a letter written in 1956 by David Rogerson, one of his roommates and contacted him. We thought it a good idea to try to find other airmen that served alongside us. We searched telephone directories, placed adverts in magazines and on Channel 4’s teletext helping to find old friends in the military. Initially we sought members in the RAF. 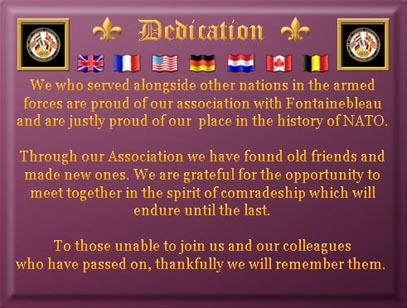 The floodgates opened and we were inundated with replies to the extent that we decided form an Association open to all the Armed Servicemen and civilians of all nations who served at Fontainebleau. Our first Newsletter was published in October 1997 and in the same year we held our first Reunion in Leamington Spa where it was decided to formalise the Association. Over the years more than 300 Veteran have joined. Alas many have passed on but the Association continues to thrive. Our Reunions are held in October each year. Other activities include coach trips to Fontainebleau where we have gained access to Camp Guynemer. A small contingent attends the Annual Memorial Service at Yevres for the aircrew who were killed ditching their burning Wellington Bomber in a field thus avoiding crashing on the village. 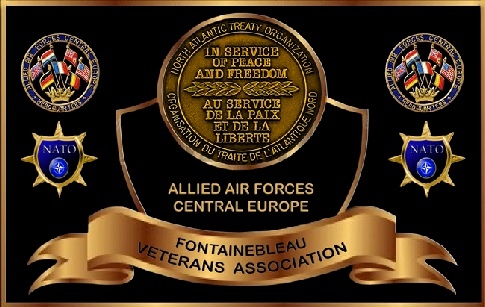 This site will be been re-designed to provide information and news about the Fontainebleau Veterans Association, HQ AAFCE and its members. Every effort will be made to provide you with accurate information, although consequently we may make mistakes and cause offence or annoyance for this we apologize unreservedly. For any reason you object to anything contained herein or do not wish your name or photograph to appear please advise the web master. please Email the webmaster with details of infringement.